Members of Saugatuck Congregational Church sing carols on the Great Lawn of the fire-damaged church Sunday afternoon. 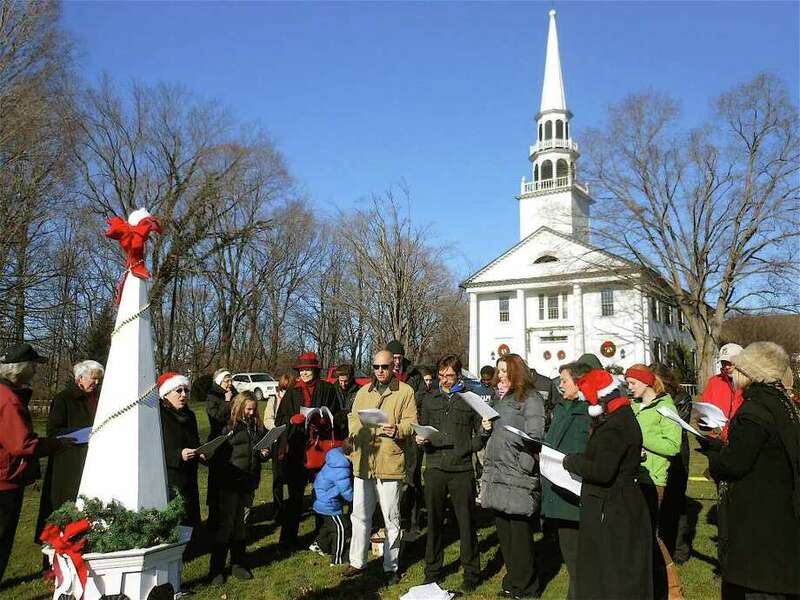 It takes more than a serious fire to mute the Christmas spirit of Saugatuck Congregational Church members who gathered on the property's Great Lawn to celebrate the season by singing carols midday Sunday. As carols rang out on a clear, cold afternoon, yellow police caution tape, tied from one post to another behind them, fluttered in the breeze in front of the historic sanctuary, a stark reminder of the Nov. 20 blaze. That night, a fast-moving fire began at the rear of the church complex, destroying administrative offices, meeting rooms and the nursery school. But firefighters from Westport and five other communities contained the flames from ravaging the 179-year-old main sanctuary, although it did suffer smoke and water damage. The fire has reshuffled the congregation's traditions at Thanksgivng and Christmas as insurance investigators continue to inspect and assess the damage at the 245 Post Road East property, according to Doug Johnston, chairman of the Board of Deacons. "Onwards and upwards," Johnston sighed, adding that the carol sing was organized by the Music Ministry team as a "chance to celebrate the Advent and Christmas season, and bring joy and happiness back into an otherwise challenging situation." Church members began the morning at Temple Israel, where they were invited to hold their normal 10 a.m. service and Fellowship Hour. At noon, they shuttled to the church and, afterwards, planned to visit a number of other church members who are homebound. Johnston said the church hadn't staged a lawn caroling in several years, so it was particularly significant to have one this year. "People have been rallying due to a huge emotional boost shared with and shown to the congregation by both local and far-reaching communities," he said. "We're not daunted by what we're facing and will probably be stronger for it. It's all going to work out, and we've been blessed by a beautiful day." The fire event has actually served to boost attendance at services remarked choir member Betsy Boak. "It's at a record high level as people draw together in the spirit of restoration and renewal," she said. "Our church leaders -- clergy, lay leaders and choir director -- are inspiring the spirit of Christmas and we are all working together to restore the church building. The congregation itself is thriving." Boak added that even though the church is in need itself, members are reaching out to fulfill the community's needs through an Angel gift drive, coat drive and financial support to assist people in need. "Our annual Christmas dinner -- the Saugatuck Christmas Feast -- will also take place as it has every year," she said, though the site will be the Christ & Holy Episcopal Trinity Church, 75 Church Lane, at 11:30 a.m. Dec. 25. "Everyone is invited."